Maintain hygiene practices during pedicure treatments with these disposable white polyethylene thong slippers. Non-skid soles provide extra traction on slippery floors. Keep feet warm and comfortable during and after pedicures with these toe-less pedicure socks. 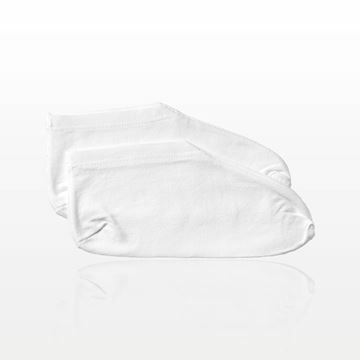 Keep feet warm and comfortable after foot treatments with these white cotton ankle socks that are reusable and washable. The socks are packaged in pairs in a retail hang bag and are perfect for resale or can be offered as a gift with purchase. Soft, disposable salon and spa slippers provide a pampering touch and hygienic benefits. We offer footwear designed especially for the nail salon or spa environment. Our quality selection features wholesale spa slippers made of welcoming terrycloth material in thong or economical open-toe styles. Our one-size terry slippers are a customer favorite because they share inviting comfort and a layer of warmth for the client. Spa socks also support hygienic environments. 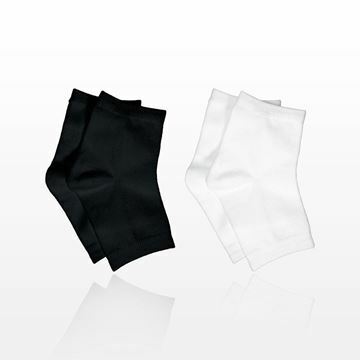 They feature the softness and absorbency of cotton that caters to the client’s needs. Disposable spa slippers and socks from Qosmedix meet the elite standards of the exclusive spa or salon. There’s no need to expose the entire foot to cool temperatures during a pedicure. With wholesale spa socks, only the toes are exposed. While the nail polish dries, feet stay warm and clients remain comfortable. These one-size pedicure accessories are synonymous with a higher level of customer care. Individually packaged pairs of pedicure socks and slippers allow clients to have greater peace of mind during their appointments. Our toe separators are also packaged in pairs. Thong spa slippers, socks and separators provide pampering extras that clients appreciate. Qosmedix believes in the benefits of comfortable coverage. That’s why we offer footwear and apparel that clients deserve. Our pedicure sandals and spa robes make a perfect pairing. In addition to providing warmth and protection, spa footwear adds an element of safety. Our selection includes non-skid sandal styles for improved traction on a range of flooring. You can order spa or salon slippers in bulk from a company that shares your customer-first philosophy. Shop with Qosmedix today and meet business needs beautifully.